Review: Marie Claire, Jenny Montana, Nick Jaina and Paddy Reagan at The Monkey House, Friday, March 21. In music, as in any discipline, proficiency and professionalism only come with experience. To become truly seasoned, there is but one avenue an artist can pursue in hopes of reaching this elusive upper echelon: relentless performance. Last Friday at The Monkey House in Winooski, Nick Jaina, a legitimate musical road warrior, shared the stage with three up-and-coming local products, Marie Claire, Jenny Montana and Paddy Reagan. While it might be unfair to hold less experienced acts to the same lofty standards one would apply to the Portland, Oregon, songwriter, the evening highlighted stark contrasts between a battle-hardened vet and and a trio of talented but raw local performers. Indie chanteuse Marie Claire began the show with a medodically challenging brand of melancholic piano-pop. In a noted departure from the sassy, sultry turns she's better known for as a cornerstone of Radio Bean's Honky-Tonk Tuesday, the singer's stage demeanor was coy and often endearingly demure. But at times it seemed her confidence waned. Stripped of the crack backing band she's likely become accustomed to on Tuesday nights, Claire performed solo, with only a keyboard between herself and the audience. The musical equivalent of walking a highwire with no safety net, it's an intensely intimate and vulnerable position. Claire is typically a commanding presence on stage, so to witness this side of such an accomplished musician was intriguing, to say the least. Nerves aside, Claire's performance illustrated her unique gift for melody and allowed her to employ her impressive pipes in a manner other than country warbling. Americana tunesmith Jenny Montana followed, with Allissa Helland on percussion and Jason Pepe on backing vocals and bass. Montana is one tall drink of water and, as such, is an immediately prominent figure on stage. The sizeable crowd fell hushed as the songwriter began her set. Montana's vocal delivery is impossibly easy; she lilted through song after song of charming, introspective folk-pop, stopping only to remark on how attentive the audience had been. Unfortunately, the singer's effortless flow and simplistic finger-picked guitar style could be mistaken for disengagement, particularly in a crowded bar on a Friday night. To wit: Roughly midway through her set, the audience resumed its conversational murmurs and clinking glasses. Perhaps in response to the swell of bar noise, Montana's gentle croon grew thin, particularly in the more dramatic segments of her tunes, as her voice seemed to strain above the clamor. Nick Jaina took the stage and served up a set of brooding indie-folk. The lavish orchestrations of his most recent album Wool were replaced by a stripped-down ensemble featuring upright bass, minimal percussion and some kind of miniature xylophone. With hardly a word to the audience, Jaina and his cohorts wound their way around some of the most slyly sinister tunes this side of Joe Henry. Despite the relative lack of interaction, the band enraptured the crowd with a slinky blend of mystery and polish. Jaina's vocal delivery is rather plain, his melodies largely unadventurous. But lyrically, he's a force to be reckoned with. In a rare feat at the often cacophonous Monkey, the band stumbled upon the perfect volume level, allowing the songwriter's deft poetic ruminations to take center stage. The effect was arresting. Local songwriter Paddy Reagan closed out the night, flanked by a consortium of instrumentalists. The group apparently came together somewhat on the fly, as Reagan headlined the show by default - no one ever wants to play last, apparently. The septet was predictably disjointed at times, though the disheveled vibe suited Reagan's quirky songwriting style. By and large, the band ably backed their charmingly boyish front man, fleshing out tunes from his debut EP, Hey! 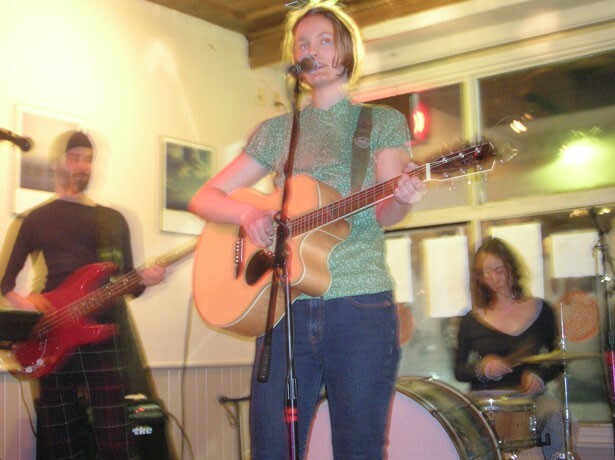 Though a bit rough around the edges, each of the three local acts offered demonstrated burgeoning ability and possibly even more natural talent than their road-tested counterpart, Jaina. Given time and experience, all three will no doubt mature into polished professionals. Meanwhile, Friday night's show was an apt reminder of the wealth of talent, raw and otherwise, brimming in our little corner of the world.